Among gluten-free food companies, Schar's variety is perhaps the most diverse of all. Italy-based Schar opened its North American headquarters in Lyndhurst, New Jersey in 2007. Since then, the company has introduced stateside a number of products that contain other grains in place of wheat. Schar sent me several of its products to sample: tagliatelle and spaghetti, pizza crust, bread crumbs, breadsticks, shortbread cookies and ladyfingers. Most of these items, like some others I've tried from the company, are first-rate, although a few come up short. We keep handy in our house Schar's rolls, both the ciabatta and sandwich kind. The textured and grainy ciabatta bread is par-baked, requiring about 10 minutes in a pre-heated oven to bring out the flavor. We pop a frozen sandwich roll into the microwave for a minute whenever hamburgers are on the menu, whether at home or at a restaurant. Other standouts from the company include the chocolate hazelnut bars, chocolate-dipped cookies, ladyfingers, pastas (made from corn and rice flours) and new snack crackers, which formerly were produced by Glutano. I was less impressed with the pizza crusts and breads, which come in vacuum-sealed packaging. Even after topping with sauce and cheese and baking, the crust was dry and not particularly pliable. The same can be said about the white and multigrain bread loaves. The shortbread cookies lacked the buttery taste this variety is known for, while I found the Italian breadsticks lacking zest. 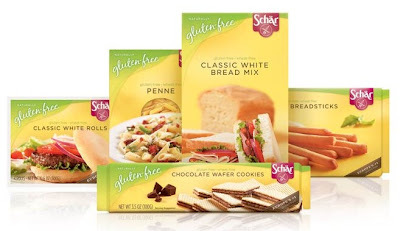 Overall, most of Schar's gluten-free products are worthy of consideration, especially the unrivaled items like the ciabatta rolls and chocolate hazelnut bars. Many products are available locally at Wegmans and natural foods stores (click here for a store locator), and online at Amazon.com, The Gluten-Free Mall and Schar's own e-store. Schar's spaghetti is the only gfree spaghetti my family will eat! We love all the Schar pastas! If only Schar made a lasagna noodle!